Seating is available for groups of (3) only. Seating is available for couples only. This is shared seating. You agree to share a table with other seated vip ticketholders. * Your table is located in Buca di Beppo, located above Planet Hollywood. Guests at Buca will have access to go downstairs to Planet Hollywood. 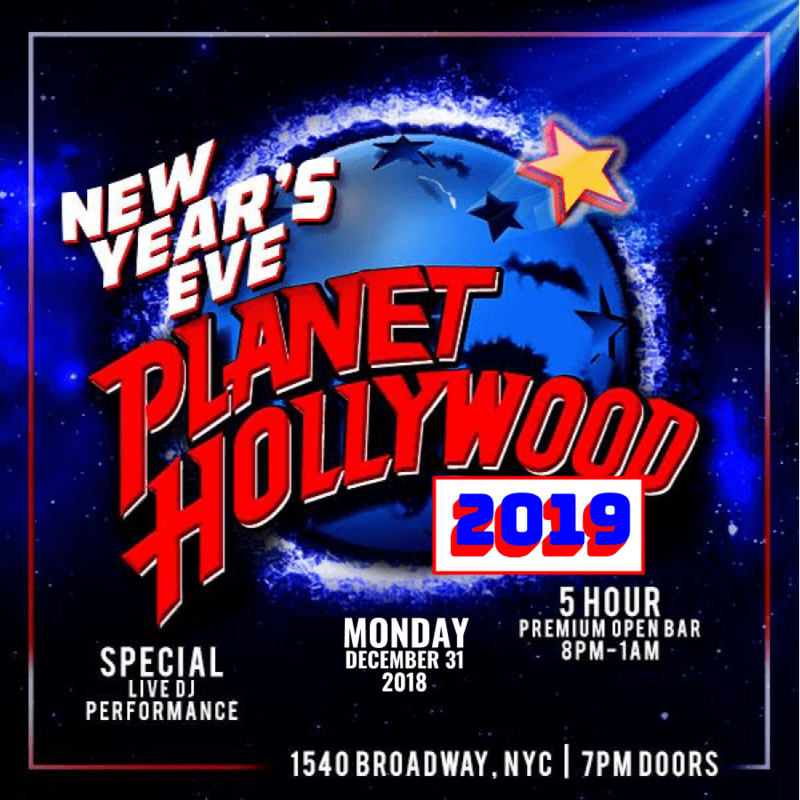 New Year’s Eve 2020 explodes into blockbuster revelry at NYC’s Planet Hollywood Times Square. The New Year’s Eve party inside Planet Hollywood is an edge of your seat thrill-ride featuring a 5 hour open bar and all night dancing to get your New Year started right. 3 hours of early evening appetizers will make you feel like the toast of Tinsel Town while big screen TVs barrage you and your fellow revelers with film, television, and music video clips as the party reels towards the BIG moment. The NYE indulgences include a live DJ spinning the hottest New Year’s soundtrack, a high-energy crowd dancing, and blockbuster NYC party favors to have you feeling like the protagonist of your own New Year’s movie –especially at midnight, when a plethora of huge flat screens simultaneously zoom in on the live ball drop as the clock strikes midnight and a complimentary champagne toast is hoisted to the stars, ringing in the New Year. 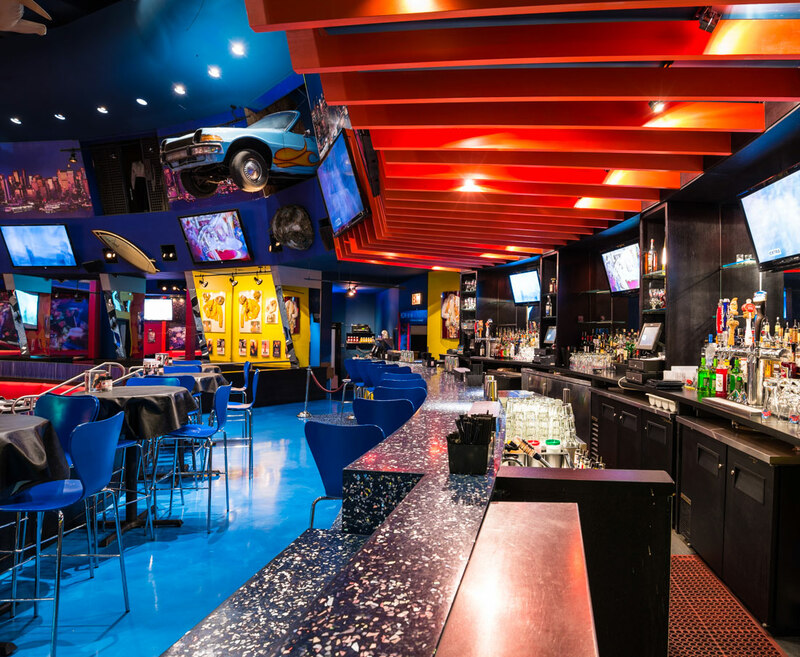 You’ll feel like a star while imbibing signature cocktails like Indecent Proposal and The Terminator at Planet Hollywood Times Square this NYE. Whether you’re looking for family-friendly fun or all the allure of Hollywood this New Year’s Eve, there’s only one event for entertainment in NYC’s Time’s Square. Party into the wee hours at Planet Hollywood or feel like The Godfather amid Buca di Beppo’s plush carpet and intimate atmosphere – it’s your call. 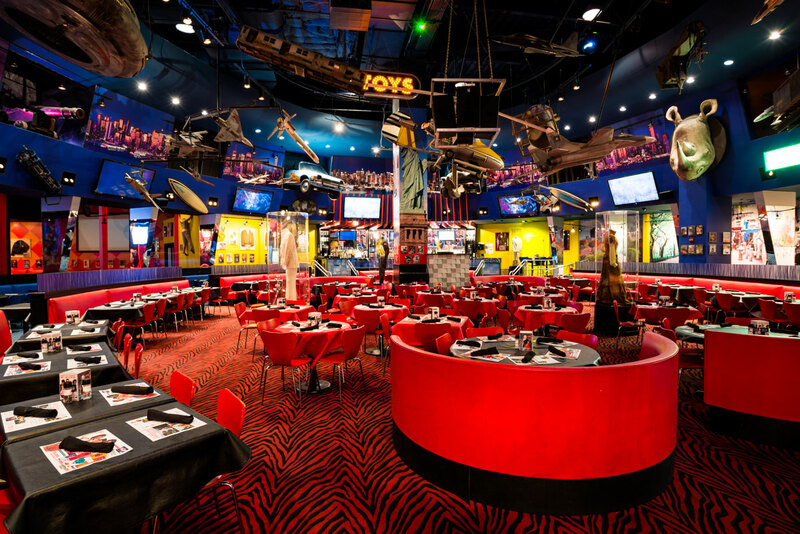 Planet Hollywood Times Square is an immense space offering two unique NYE experiences: electric Planet Hollywood and classic Italian eatery Buca di Beppo. Enjoy cocktails and delectable appetizers amid some of Hollywood’s greatest memorabilia in the Planet Hollywood downstairs, or relax upstairs with the warm, inviting setting of Italian restaurant Buca di Beppo's family style dinner (VIP in Buca type tickets only). Either choice guarantees an unforgettable evening right in the heart of Times Square. With multiple VIP options to choose from, there’ll be no shortage of action, drama, and romance at Planet Hollywood Times Square this New Year’s. Are you ready for your close up? Make sure to have your physical ticket(s) on hand because you will need to show it to NYPD and security upon request. Tickets are provided via shipping or ticket pickup ONLY. If you select shipping as your delivery method, tickets will begin shipping in December. If you select pickup as your delivery method, tickets MUST be collected in advance of the event from our NYC Ticket Pickup Center. Tickets will available for collection at our NYC Ticket Pickup Center ONLY. Tickets will NOT be available for collection at the event venue. You will NOT be able to access or enter the event without collecting your physical tickets in advance. The exact address and hours of our NYC Ticket Pickup Center will be announced in mid December. This information will be available at balldrop.com/pickup. Please check often since times and dates are constantly being updated. You will receive a packet with your admission tickets as well instructions for New Year’s Eve, including when and where to arrive at the correct police barricade in order access your party. *** Enter the Times Square area at 45st Street & 6th Avenue as regulated by NYPD. Admittance restrictions may be in place during the ball drop (11PM - 12:15AM). Regardless of admittance time to your party, make sure to enter the Times Square area no later than 8PM.